South Korea and the US will decide whether to freeze the allies’ joint military exercises in the near future after close consultation, the presidential office said Friday. 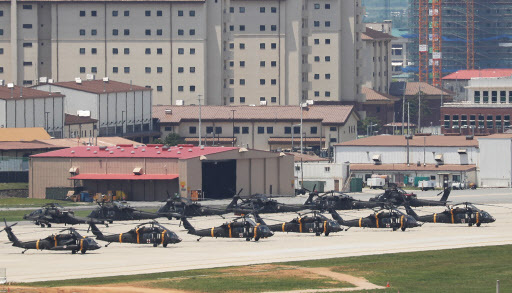 The possibility of the suspension of the military exercises is growing after US President Donald Trump said the US would halt “war games” after a historic summit with North Korean leader Kim Jong-un in Singapore, and the South Korean President Moon Jae-in signaled his support. “Nothing has been decided yet, but (we) will announce our position soon through close consultation between South Korea and the US,” an official from the presidential office told reporters on Friday on condition of anonymity. South Korea’s defense minister Song Young-moo and his US counterpart James Mattis held 30-minute talks over the phone on Thursday to discuss the possible suspension of the military exercises scheduled for August, named Ulchi Freedom Guardian, Seoul’s defense ministry said Friday. In response to Trump’s surprise announcement, South Korean President Moon Jae-in said that South Korea will “carefully consider” the possibility of suspending the joint military drills with the US. “If North Korea implements denuclearization measures and continues to have sincere dialogue with South Korea and the US to ease hostile relations, we need a flexible change in our military pressure on North Korea in line with the spirit of building mutual trust as agreed in the Panmunjeom Declaration,” Moon said in a National Security meeting Thursday, according to the presidential office. South Korea holds major combined exercises -- Key Resolve, Foal Eagle and Ulchi Freedom Guardian -- with the US annually, involving thousands of troops and months of planning. Pyongyang has reacted furiously to the drills, denouncing them as “provocative” and a “rehearsal for war.” As Seoul and Washington conducted air combat drills, called Max Thunder, in May, the North canceled high-level inter-Korean talks and threatened to pull out of the planned summit with the US. The allies say the drills are defensive in nature. The possible suspension of South Korea-US joint military drills has fueled concerns here over a weakening of the countries’ decadesold security alliance. The Cheong Wa Dae official also hailed the US-North Korea summit for laying the groundwork for North Korea to become a responsible member of the international community and a “normal state” so that the North can gain confidence to push for denuclearization and open up its society. “There is a great deal of difference in North Korea before the Singapore summit and after the summit,” the official said. Despite criticism that the joint statement signed by Trump and Kim Jong-un fell short on details, the official said it is significant that North Korea publicly made a “firm and unwavering” commitment to the country’s denuclearization. On a declaration of ending the 1950-53 Korean War, the official said that South Korea is reviewing the possibility of the two Koreas and the US jointly declaring an end to the war. “Depending on how negotiations (between North Korea and the US) proceed, I expect talks over declaring an end to the war and changing an armistice into a peace treaty will resume at an appropriate time,” the official said. The 1950-53 conflict ended in an armistice, which has left the Koreas technically still at war. The official dismissed concerns over the possible withdrawal of the US troops stationed in South Korea, saying it is the issue of alliance between South Korea and the US and is not subject to negotiations between North Korea and the US.